As a Texas medical doctor and Dallas Pradaxa drug injury and Pradaxa wrongful death attorney, I am providing this timely update for folks who have been injured by the use of Pradaxa. Many wrongful death victims are seeking compensation for their injuries from German drug maker Boehringer Ingelheim, the maker of Pradaxa. The new anticoagulant blood thinner Pradaxa has been associated with an increased risk of serious and potentially deadly bleeding episodes. The F.D.A. 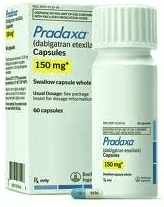 approved Pradaxa in October 2010 and Pradaxa was touted as the first in a new category of replacements for warfarin. Warfarin is a 60-year-old drug used to prevent strokes in people with a heart-rhythm disorder known as atrial fibrillation. Warfarin requires careful monitoring of a patient’s diet and drug regimen, and frequent blood tests to ensure that it is working. Pradaxa requires no blood tests and when compared with warfarin, was touted to be better at preventing strokes. Pradaxa side effects include uncontrollable hemorrhages, particularly in the elderly and those with reduced kidney function. Additionally medical reports suggest that Pradaxa has proven ineffective in some cases, leading to deep vein thrombosis and pulmonary embolism due to blood clots Pradaxa failed to treat. The standard anticoagulant warfarin can be quickly reversed by Vitamin K when a bleeding problem occurs. There is no such antidote when Pradaxa side effects cause internal bleeding. Pradaxa has become a blockbuster medication with more than $1 billion in sales for German drug maker Boehringer Ingelheim. Pradaxa has been linked to more than 540 deaths in the United States, and numerous complaints from experts who worry that Pradaxa is a potentially dangerous drug that is sold without an antidote. The Food and Drug Administration released a report this week that found that the drug did not show a higher risk of bleeding than for patients taking warfarin. But Pradaxa was touted as being safer than Warfarin. Medical reports have demonstrated that Pradaxa side effects are increased in older people or those with kidney problems. The company recommends testing patients’ kidney function before prescribing Pradaxa and states that the risk of bleeding increases with age. According to the F.D.A. about 725,000 patients in the United States have used the drug, Pradaxa was identified as the primary suspect in 542 patient deaths reported to the F.D.A. in 2011, and was linked to more reports of injury or death than any of the more than 800 drugs regularly monitored by the Institute for Safe Medication Practices, an organization that monitors medicine safety. Two other new drugs intended as warfarin replacements also lack antidotes. Medical experts said they had not seen as many bleeding deaths associated with Xarelto, which was approved in 2011 and is sold by Bayer and Johnson & Johnson. On Friday, the F.D.A. approved Xarelto to also treat deep vein thrombosis and pulmonary embolism, two kinds of blood clots. A third drug, Eliquis, by Bristol-Myers Squibb and Pfizer, has not yet been approved by the F.D.A. Read more here and visit my website for further information.